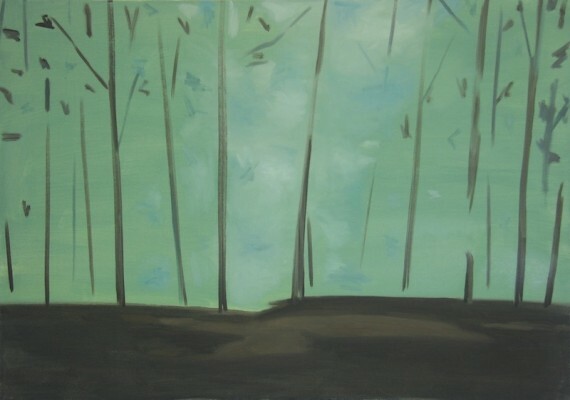 43 Inverness Street is pleased to announce a solo exhibition by London based painter Hideatsu Shiba. 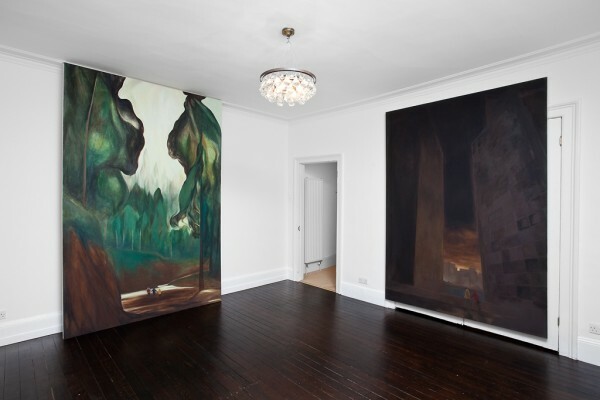 For this exhibition, Shiba has installed four large oil paintings on canvas in the domestic spaces at 43 Inverness Street. Each is at once a meditation on the sublime and a practice of broken up space in the vertical format. 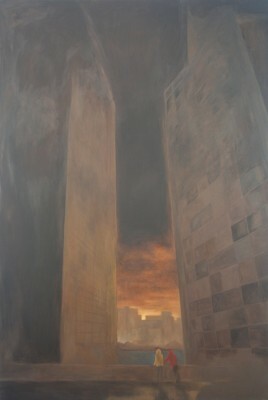 Three of the paintings represent a natural environment and a fourth, Daybreak, 2011, is a brooding view through a canyon-like gap between two skyscrapers. Dark proximal tonal shades of night pervade this work, broken only by the small glow of the arrival of the sun. 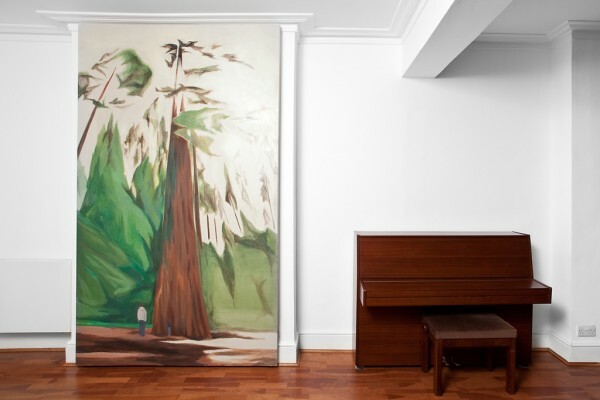 But, as in the other three large paintings in this exhibition, the viewer is confronted with a grand representation of a spectacular vista in scale. The background in Shiba’s works functions as both atmosphere and essence of the subject matter. The lines depicting trees, flowers, rocks and buildings are only suggested representations of the subjects while the background works in tandem with the brush marks to produce the full effect of the landscape. The rhythm and directions of the brushstrokes build the pictorial language of space. 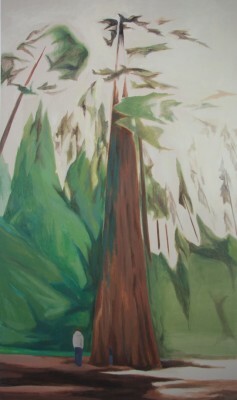 In Big Tree, 2010, the height of an immense redwood tree is cannily constructed of an oblique triangular shape. The tree, rooted in the center of the painting, is solid and immense, but it somehow disappears into an atmospheric perspective above the heads of the figures below, and because of the height of the painting, it also fades out of view over the head of the viewer. This trick of size and scale — real human scale, gives the work a double life. 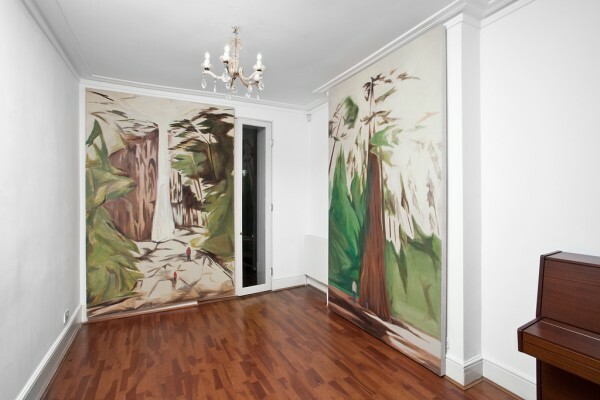 The believability of the images is subtly abstracted between different zones of the painting. Looking up and down creates a change in perspective and time, and this is achieved through careful compositional movements. With influences as diverse as Muromachi period Japanese landscape painting and American figurative painting from the ‘60s and ‘70s, the paintings communicate a fresh openness with a clean decisive rendering of imposing elements of our surroundings. In the Hikers, 2012, three small figures are dwarfed by an immense forest. The forest is a diverse world of muted colours and textures. Closer to the bottom of the painting, tree forms are hinted at and subtly teased out of the soft natural palette in lights and darks. But the inevitably gently climbing rhythms of branches and leaf forms give way eventually reaching a massive crescendo of solidity and abstract masses of woven brushstrokes at the top of the canvas. This quartet of pictures comprise a natural extension of Shiba’s previous works, whose casual beauty and effortless compositions were often captured on a small scale. In the Flowers series, the subject is suggested by the colour of the background. 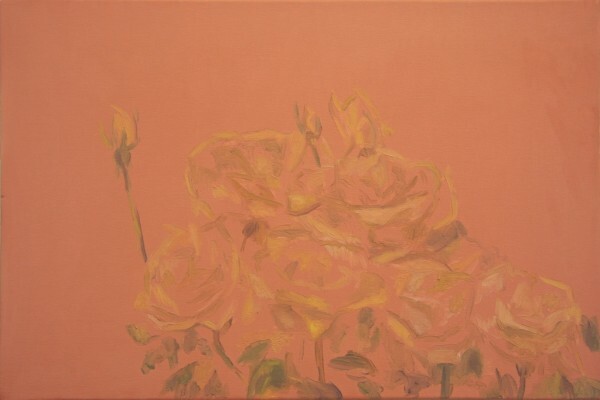 In Flowers (Roses) (2003), the discontinuous outline of the roses creates a silhouette of the flowers against the background, causing the flowers to be submerged into the dusty rose colour. 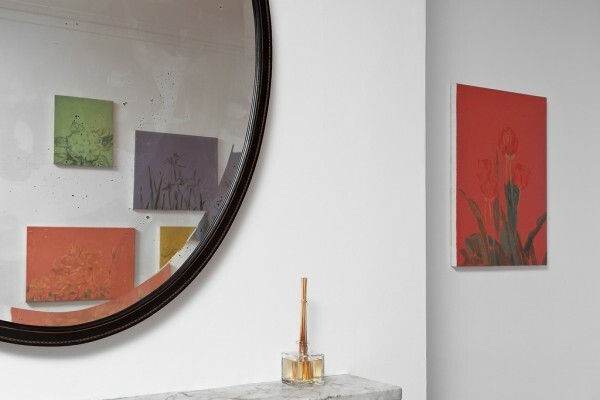 His latest works bring the modest promise of those earlier paintings of flowers to an awesome statement of painterly ambition. Hideatsu Shiba (b. Japan 1973) lives and works in London. He studied at Byam Shaw School Of Art (BA Hons/ Fine Art), Goldsmith College (Postgraduate / Fine Art) and Chelsea College OF Art (MA / Painting). 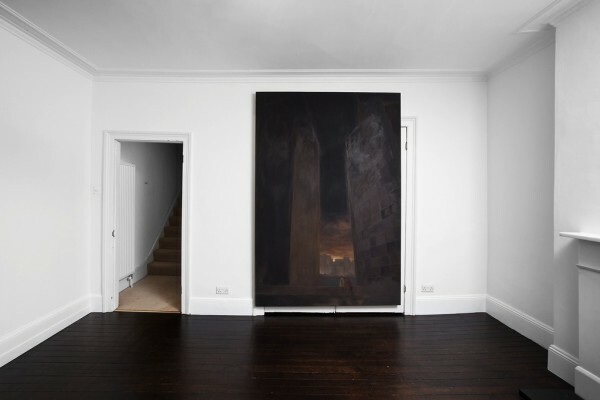 He has had solo exhibitions at Laurent Delaye Gallery in London and One In The Other Gallery in London. His work has been in international group exhibitions in Scotland, Prague, and Iceland as well as venues in England.